Virgil Paul Lozzi (1923-1962), former professional Big Band saxophone player, writer, musician, actor, model, artist, pilot, realtor, insurance broker, banker, and outdoorsman. Born in New York State. Died at age 39. Virgil Lozzi became a New Jersey State Champion swimmer and an accomplished saxophone prodigy by the age of 12. Lozzi was so proficient on the saxophone, that in 1936 he won the first place prize on the Major Bowles Original Amateur Hour, the nation's number one radio show. Today that accomplishment would be the equivalent of winning television's Star Search or American Idol. 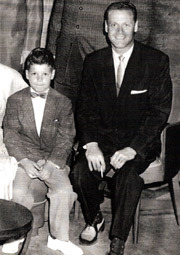 Famed singer and band leader Rudy Vallee, a former sax player himself, was one of the celebrity judges. Because of this win, Lozzi was then recruited by many Big Bands including the Nick Liguori Orchestra in New Jersey/New York, the Columbia Pictures Orchestra, Nelson Riddle, and the Les and Larry Elgart bands. He excelled in the "reeds," including alto sax, clarinet, and baritone sax. Besides Rudy Vallee, Lozzi was known well by front singers and band vocalists such as Frank Sinatra, Doris Day, Peggy Lee, Tex Beneke, Burt Parks, and many more. Lozzi was also a talented child actor who appeared in supporting roles on Broadway in the 1930's including Tom Sawyer and Little Women. He retired from the Big Bands in 1947 after touring and recording (RCA Records) with star Big Band leaders Les & Larry Elgart. During WWII Lozzi was chosen as a young saxophone/clarinet player (age 18) for the official U.S. Army Air Force Band and toured the United States during War Bond Drives and Hollywood star USO tours. He was also trained in combat and was assigned to guard positions at POW camps in Louisiana, including Camp Livingston where he reached the rank of Top Sergeant. He was a liaison between Italian and German prisoners of war and the O.S.S., the precursor to the CIA. Lozzi achieved highest honor medals as a marksman with various weaponry and was honorably discharged after the war in 1945. His older brothers Louis and Dante Lozzi were both assigned to the European theater and fought against the German army and Nazi SS divisions in France and Germany, including the Battle of the Bulge. In 1945, while still in the army, Lozzi married Elizabeth Ann Rhodes, the only daughter of Raymond L. Rhodes, former newspaper distributor and real estate and insurance industry magnate, who went on to fame as Republican Party Delegate from the State of New Jersey and as a cabinet member chosen by President Dwight D. Eisenhower. In 1947, the same year Lozzi retired from the big bands, he was invited to join the Raymond Rhodes Agency, Inc., located in Hawthorne, New Jersey, a suburban bedroom community of New York City. He gave up his horn and the band's thousands of fans after foreseeing the demise of the Big Band business. The Rhodes Agency, Inc. became one of the largest real estate and insurance brokers in the state. It was founded in 1936 and still exists today. Lozzi excelled as an insurance underwriter for the Glens Falls Insurance Company in New York which was a training ground for him to eventually become President of the Rhodes Corporation. In the 1950's, while Raymond Rhodes was in Washington D.C. on official duties for the President and traveling the world as Comptroller of U.S. Customs, a cabinet level member of the Treasury Department, Lozzi ran the Rhodes Company's insurance operations. He successfully tested for and received his New Jersey real estate and insurance brokers licenses as well as sales and underwriting honors from the Glens Falls Insurance Company, Lincoln National Life Insurance Company, The Hartford Insurance Companies, and many others. From 1947 until his untimely death in 1962, Lozzi excelled in his field. As President of the Rhodes firm, he increased the client roster, breaking many sales records. At this time he also received his private pilot's wings and was often seen buzzing golf courses, friends' homes, civic events and flying fishing trips in a custom canary yellow Piper Cub. In 1954, Lozzi designed his dream house, a split-level brick and redwood California ranch design with state of the art materials, electronics, bathroom designs, designer furniture and landscaping features never seen before. The one and one-half acre property, located on a prestigious hill in the suburban town of Hawthorne, New Jersey, received architectural, landscaping, and design awards and commendations as well as nationwide press coverage. Built by Schuring Construction over a one-year period, the home remains highly coveted today over 50 years later with a constant list of many potential buyers. In 1957, Lozzi was elected President of the Hawthorne Rotary Club, an internationally known fraternal organization with membership limited to business owners in their communities. In 1959, Lozzi was chosen to join the Board of Directors of the new Peoples Bank of Hawthorne, which became the Prospect Park National Bank, the most prestigious bank in the state of New Jersey. Lozzi was also a member of the Passaic County Insurance Agents Association and a member of its executive board. He was a member of the American Legion Veterans Organization as a veteran of WWII. He was a corporate member of the prestigious Hamilton Club in Paterson, New Jersey, and the North Jersey Country Club where he was also a scratch golfer. In 1960, at age 37, at the peak of his career in real estate, and after the birth of his second son Marco, Lozzi was diagnosed with terminal kidney and lung cancer, attributed to almost 20 years of smoking. For the last six months of his life Lozzi submitted himself to voluntary experimentation at the renowned Sloan Kettering Memorial Cancer Research Center and Hospital in New York. He donated his living body to science and suffered from horrible experiments in radiation and chemo-therapy. He stated that he didn't want his children and other family members to die of cancer. He died on September 16th, 1962, at the young age of 39. The funeral service was one of the largest ever in Hawthorne, New Jersey, with a few thousand people over capacity in attendance, including the Mayor, Congressman, Senators and government and business officials from all levels of society. The funeral guest and flower cars stretched out over 2 miles. Flags in the Borough of Hawthorne and Passaic County's public buildings were lowered to half mast in his honor. Virgil Lozzi was survived by his wife, the former Elizabeth Ann Rhodes, their children, including daughter Rae Ann, son Edward, daughter Robyn, and son Marco. He was also survived by parents Edward and Helen Lozzi, and his successful siblings, brother Louis, sister Giovanna, brother Dante, and sister Elodea. Click here for a printable PDF version of this biography. 1. 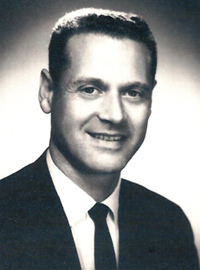 Official Portrait: Company photo of Virgil Lozzi at the time of his death in 1962. 2. 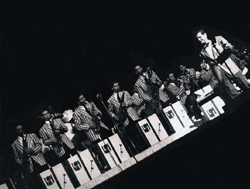 Virgil Lozzi (1st standing on right with Bartone sax) with Les Elgart and the Les Elgart Big Band, 1945. 3. 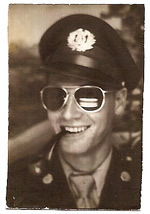 Virgil Lozzi in USAAF Army Air Force Non-Com Officers Uniform and aviator glasses, 1943. 4. Virgil Lozzi with his son, Edward, on board the Queen Elizabeth oceanliner, 1956.